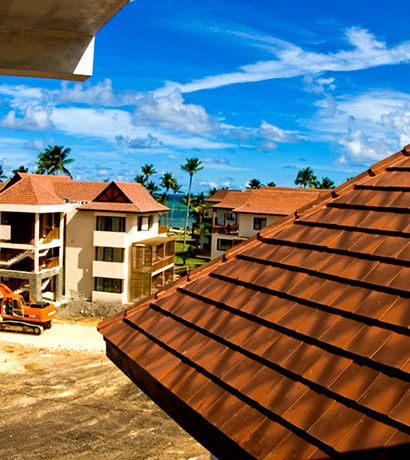 Not every roof is fit for traditional construction methods such as shingles or tiling. Low-sloped and flat roof systems, often seen in commercial buildings (but can appear in residential homes), are better suiting to coating. When coating a roof, we apply a seamless film to the existing roof structure that, when dry, acts as the top layer of the roof in much the same way shingles do on traditional sloped roofs. This top layer creates a membrane that keeps out water and, in many cases, can extend the life of a roof for over two decades. One of the bigger concerns with flat and low-sloped roofs is the pooling of water, something most coating materials are not rated to handle. However, with the techniques at our disposal, we can minimize this hazard to ensure your roof stays watertight. Roofs coated in special materials can even increase the efficiency of your indoor heating and air conditioning, reducing the costs of both. Another advantage coating has is its relatively low cost of the process itself. Other roofing methods can require the removal of previously built layers which means more labor hours and more garbage in landfills. In many cases, we can simply apply another layer to the existing roof.